Yaya Toure has twice been crowned BBC African Footballer of the Year and is a four-time winner of the Confederation of African Football's African Footballer of the Year - so it not a huge shock that he is once again on our shortlist. He may have played only 23 games in 2016 - and just one this campaign - but his nomination shows his stature within the African game. And even if his playing time has been limited, his impact has again been considerable. In February he won the English League Cup for Manchester City - scoring the crucial penalty in a shootout to beat Liverpool in the final. He also helped his club reach the last four of the European Champions League and finish fourth in the Premier League, to ensure a place in the continental showpiece once again. That success meant Toure decided to stay and fight for his place in the City squad, despite the arrival of new coach Pep Guardiola - who oversaw the Ivorian star's exit when he was in charge at Barcelona. But when Toure's agent, Dimitri Seluk, claimed the player had been "humiliated" by being left out of City's squad for this season's Champions League Guardiola was incensed and the midfielder was frozen out of the team. The Catalan boss determined that Toure would not play for the club again until Seluk apologised. Although that has not happened, Toure himself has said sorry. 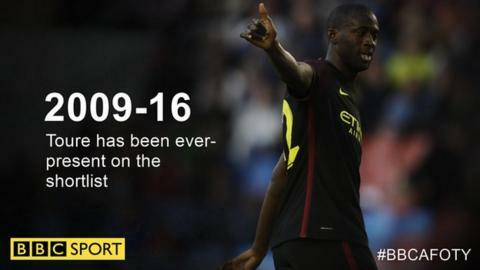 While it is not Toure's choice to be absent from his club's starting line-up, his decision to call time on his international career in 2016 was all his own. He took almost 18 months to make the decision following the Africa Cup of Nations triumph in Equatorial Guinea in 2015 and endured huge pressure to remain with the Elephants. His former national coach Francois Zahoui was among those who tried to persuade him to hold on, with the race to qualify for the 2017 tournament in Gabon and the 2018 World Cup in Russia unfolding. It is not hard to see why. With a century of appearances and some hugely significant goals to his name, Toure has been vital for Ivory Coast and he crowned his international career by leading his team to the long-awaited African title in 2015. He has also featured in every single game that Ivory Coast have played at three successive World Cup finals. But 2016 was the year he realised he had to retire from international duty - even though he admitted the final decision had not been easy. "Writing this note was probably the most difficult match of my life," he said in his retirement statement in September. But he made it clear he did not think he was fading as a footballing force. "The fact that I am 33 now, the intensity of training and the multitude of games are not the reasons why I am making this decision," he said.